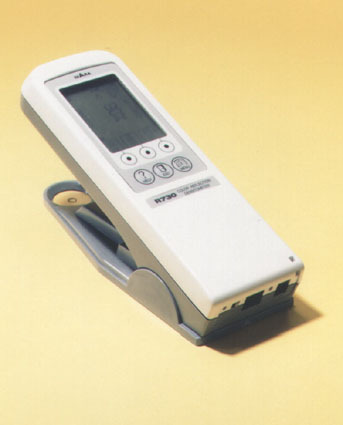 The Ihara R730 Colour Reflection Densitometer is a sophisticated QC tool. It has all of the measuring functions possible with a densitometer for full analysis of process work. For a sophisticated densitometer with every possible function for measuring process work, then you need the Ihara R730 - you won't find better value or a more accurate instrument! Simple operation means it is still fine for basic press control, but the extra features will help you detect and sort out just about anything that can possibly go wrong! Not only does the R730 allows you to measure tints, and enable you to achieve a consistent ink densities on press, but the wide range of measuring functions available is ideal for QC departments, as well as sorting out printing problems. Top Performance & Reliability Made in Japan by Ihara Electronic Industries, the R730 has proven reliability and accuracy. Menu Driven Commands Simply select the required functions from the on-screen menu - you won't ever need to read a manual. Clear and precise instructions for every measurement are displayed on the large LCD screen. Help Key Displays explanations for all measuring functions, along with answers to FAQs. Auto Function Automatically measures density or dot gain. Printer & Computer Interface Configurable RS 232 serial interface provided for connecting to a PC or printer. Fully Portable Rechargeable batteries provide up to 4,000 readings before recharging. Plate Reading Optimized function for checking control strip tints on plates - available at small extra cost. Filter/Aperture Options Standard models supplied with Status T filters, 3 mm aperture and polarized. Manufacturer's options available for Status E filters, 1.7 mm aperture and no polarization. To see the range of functions available in the range, please refer to the Selection Chart. Also, bear in mind that units with less features than the R730 can always be upgraded later if required.